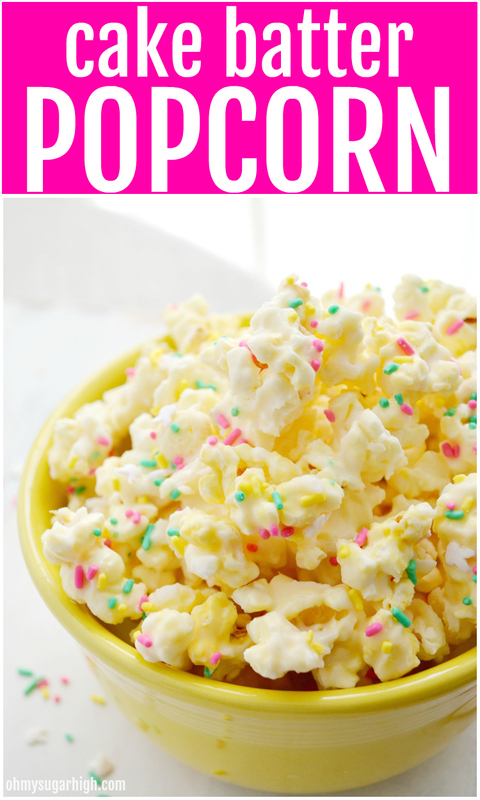 Cake batter popcorn is a super sweet and salty treat, perfect for a birthday party or as a fun Easter snack. 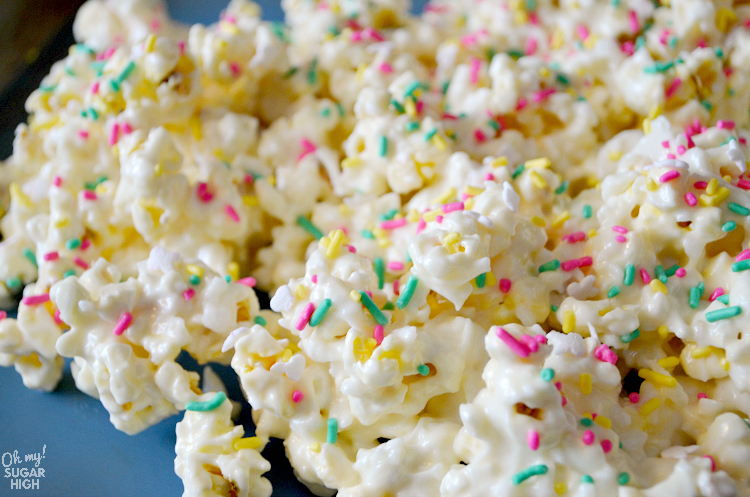 This bunny popcorn is flavored with vanilla cake mix, coconut, melted almond bark and plenty of colorful sprinkles! Whether you serve a bowl up to a crowd or hand it out as a party favor, no one can resist this cake batter popcorn! When I tried cake mix popcorn a couple of months ago, it was a big hit with my boys. I first made it for Valentine’s Day with my Valentine Cake Mix Popcorn. This recipe can easily be adapted for any holiday just by switching up a few ingredients. Sprinkles are a simple way to go from holiday to holiday. 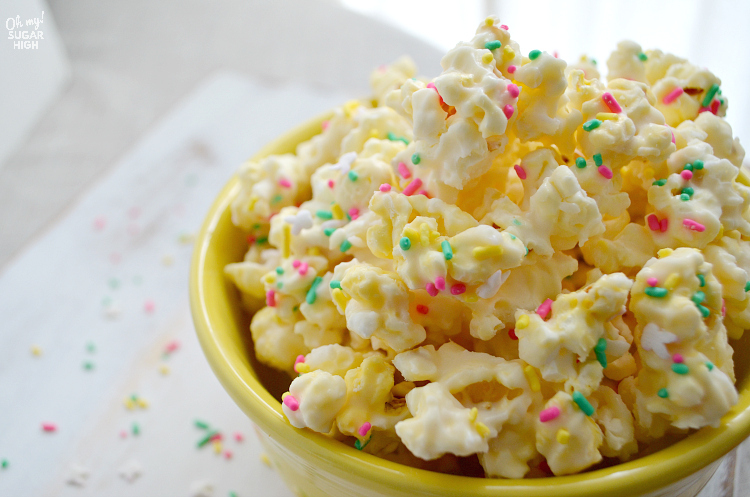 For Easter, I thought it would be fun to make a Bunny Mix Cake Batter Popcorn. 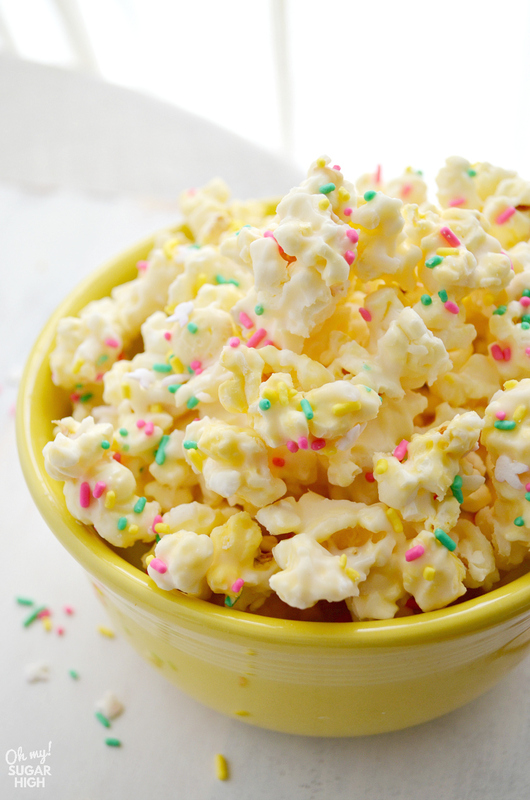 To make cake batter popcorn you’ll need a cake mix. For this recipe I went with vanilla. Line a baking sheet with parchment paper or a silicone baking mat and set aside. Add popcorn to extra large bowl for easier stirring. Melt your almond bark (or white chocolate chips) and stir in 1/2 cup of cake mix and a little oil. The oil is optional but will make your almond bark smoother. Add in coconut and stir to combine. Pour white chocolate mixture over popcorn and stir to coat. Pour popcorn onto lined baking sheet and top with colorful sprinkles. Cool completely before breaking up and storing in an airtight container. If coconut isn’t a flavor your family enjoys, you can easily substitute mini marshmallows for the coconut, or simply add them in addition. The more the merrier. There is definitely some room for additional ingredients to be mixed with the melted almond bark. Melt almond bark in microwave, starting with 1 1/2 minutes and stirring in 30 second intervals after that just until melted. Stir in oil and cake mix and mix until combined. Mix in coconut and pour over popcorn in extra large bowl. Gently stir to coat popcorn. Spread popcorn mixture into baking sheet. Top with sprinkles. Cool completely until hardened. Store in airtight container or Ziploc bag. This recipe is so easy and little goes a long way. 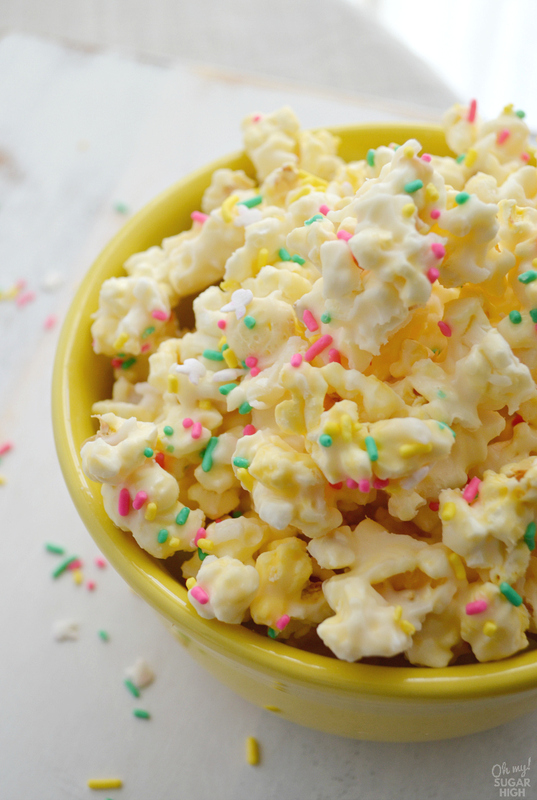 If you like really sweet popcorn, you’ll love cake batter popcorn! Holy Smokes this looks so awesome and my mouth is watering! I want some!! Thanks for sharing, visiting from Inspiration Monday Linky Party! Yum!!!! !